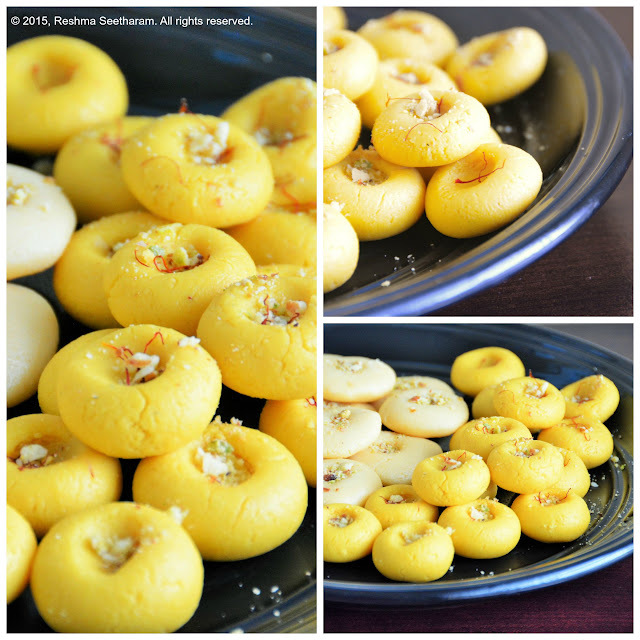 Delicious and easy to make, golden pedas/milk cakes infused with saffron, enjoy! Peel the cardamom seeds and crush them don finely with a rolling pin. Set aside. Set aside 1/4 cup milk powder aside as a reserve to correct your final product. Grease the inside of a glass bowl with ghee. Add condensed milk, milk powder, and ghee together. Stir to a smooth paste. Place it in the microwave on regular heat for 2 minutes, stopping every 20 seconds and stirring. Microwave times and heat will vary. Watch for changes from bubbling liquid to a slightly crumbly dough formation. 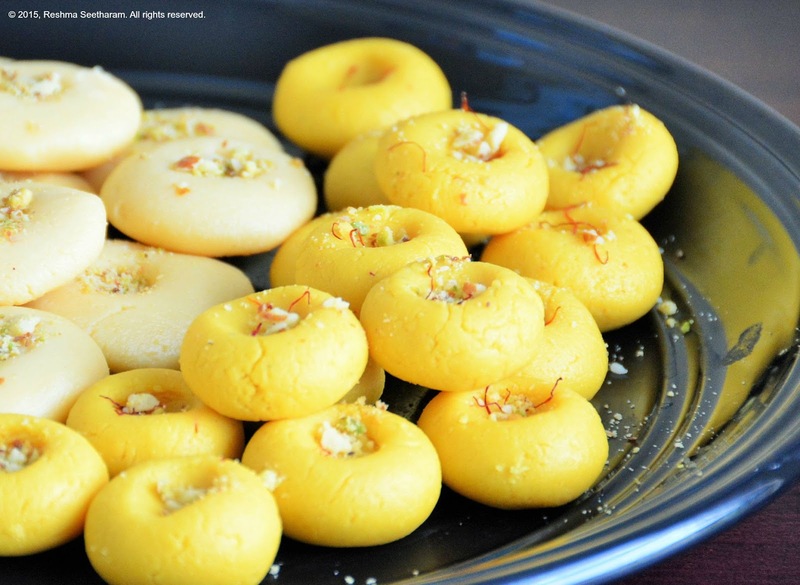 Remove and add saffron strands and cardamom powder. Once the mixture cools from hot to warm, dip your hands in some ghee, and roll little balls of uniform size. Tip: Just make sure you work with warm dough. If your mixture is too runny, use the reserved milk powder to thicken into a dough. If the mixture is too crumbly, add a few teaspoons of hot milk and milk powder to knead it back to the right consistency. Soak 1/2 tsp saffron in a few teaspoons of warm milk. Set aside for 15 minutes. Bring the khoya to room temperature, or defrost it in the microwave to a crumbly texture. You may grate it too. In a non-stick pan on low heat, add the khoya and saffron milk; cook until the milk softens the mixture. Stir continuously until the mixture changes to a soft dough consistency. Turn off the heat. When the temperature of the khoya changes from hot to lukewarm, add the sugar and knead gently with a wooden spoon or your hands. 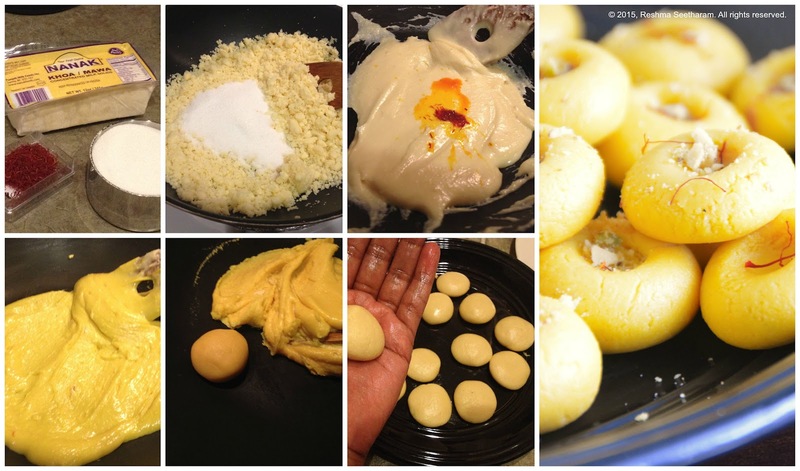 Divide the soft dough into twenty small bit, and roll each in your palm to make soft dough balls. You may smear a little ghee onto your hands for a richer flavor. Once the dough is round, press the top with your thumb to create a depression. Press in a few saffron stands or finely chopped nuts. Enjoy!